With our superb range of furniture, resources and storage solutions it’s possible to equip the whole environment both indoors and out. 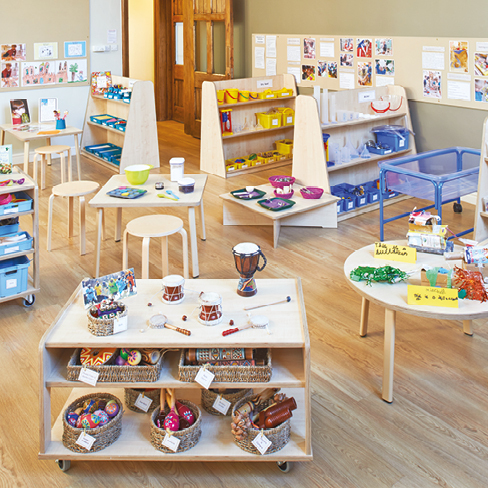 You’ll find everything you need to create highly effective continuous provision with well-designed furniture, ready-made resource collections and a comprehensive range of storage containers to support effective organisation. We support schools in transforming new and refurbished classrooms and have a fully resourced outdoor store that facilitates a variety of inspirational learning opportunities outdoors. Expert advice and a free room planning service* lead by our curriculum team. High quality furniture and resources to suit every area of provision. Ready-made resource collections to inspire outdoor learning. Practical solutions to help store all of your outdoor resources. For help in developing your learning environment indoor or out and for immediate advice about our planning service, contact Nova Robinson on 01422 311 314. *A consultancy fee of £250 will be payable should a minimum order value of £2000.00 not be placed within three months of receiving a room plan.